As the Christmas tunes started being pumped out at all the stores again this year while the Thanksgiving leftovers were still warm, I started to wonder whether we are doomed to hear these same dozen or so songs year after year forever. Will White Christmas ever fall out of style? Will Frosty the Snowman ever be forgotten? Obviously our religious Christmas songs will probably endure so long as there are faithful Christians of any stripe who cherish them, but what about these other, secular songs? And if we are doomed to hear them forever, how will we (at least those of us who are still young) react to these songs when we are hearing them in the year 2060 for the billionth time as elderly persons? I can't imagine by then there will be any charm left whatsoever in Jingle Bells, and I am sure I will probably die by choking on my own vomit if I have to keep hearing that stupid "Parson Brown" line in Winter Wonderland year after year in the nursing home. In the history of music, the best way to make a song go away is for new songs to come out that replace them. This is quite obvious; the secular, pop-hit radio station in 2009 sounds different than it did in 1989 because new songs have constantly been churned out which bump the older ones back into oblivion. Therefore, what we really need is some new songs in the Christmas canon - then, and only then, will we ultimately be able to get away from these same dozen or so songs that are stuck on repeat throughout the decades. But this brings up several huge problems. First, we certainly have had new Christmas music that has been put out constantly; almost all artists, whether punk, country, gospel, whatever - put out Christmas music. If we have this new music, then why hasn't it displaced the older canon? For the simple reason that, like most things new, the new songs are inferior. In the realm of religious Christmas music, simply nothing new has been written, at least nothing that would be fit for liturgical use. No religious Christmas music has been written recently that is even pleasant for casual listening - some except the tune Mary, Did You Know? which is a relatively recent composition by Mark Lowry that came out in 1990 and has since spread out and taken its place within the traditional canon. One other exception might be Welcome to Our World, by evangelical musician Chris Rice (1997), which I think is an excellent song. This one, however, has not been picked up on the radar and probably will not enter the canon - it is much too religious. If you've never heard it, take a listen here. However, most new Christmas music is garbage - secular junk like I Want an Alien for Christmas by Fountains of Wayne or Yule Shoot Your Eye Out by Fall Out Boy, songs that instead of turning our hearts towards the beautiful take our own debased and perverted values and paste them over the Christmas spirit, thus polluting the well, so to speak. This Christmas I've been hearing a lot of Last Christmas, written by homosexual degenerate George Michael. John Lennon's Happy Xmas is another one that makes me want to barf. How dare that ignomious enemy of religion write a Christmas song! Blah. So, with regards to new songs displacing the old ones, there either has not been any new songs of any caliber of quality sufficient to enter the canon or else they just get played a lot anyway even though they stink. So, practically speaking, the canon seems to be closed, just for the fact that our culture has not produced any musician capable of the task, probably because of the degeneration of our culture and our artistic class. But if the canon is closed practically, is there any reason why it need be closed theoretically? That is, does the fact that we seem to be incapable of bringing forth any new, virbrant and enduring Christmas songs mean that it is theoretically impossible that this will ever happen in our cultural milieu? Well, music is of course an expression of culture. The fact that we can't seem to continue the great tradition of excellent Christmas music that we had in the 18th, 19th and very early 20th centuries tells us there is something very wrong with our society. We have stopped writing these songs, and the ones we do have and repeat ad nauseam have become "traditional"; as a rule of thumb, as soon as we realize that something is traditional, that tradition is already dead or dying (see here). Basically, before we can have any more good, edifying and enduring Christmas music, we have to have a widespread return to the Christianity that gives birth to this music. Any substitutions will be hollow and vain - musicians may try to write Christmas music without Christianity, even Christian-themed music, but it will not be an authentic expression of our culture and will not consequently take on the broad appeal that the classics of ages past have. It takes a virbrant culture to produce vibrant, edifying songs that endure. A culture that cannot produce anything new and viable is a culture that is dead and ossified. Until and unless the nation becomes more Christian in character, there will be no new Christmas songs of any significance. So, while the Christmas canon may open up in the time of some future restoration of Christian culture, I would say that practically speaking the canon is closed for now. At any rate, I am not so much interested in the anthropological basis for Santa Claus; of course, we know the historical basis is loosely centered on the life of St. Nicholas of Myra, a Greek saint of Asia Minor who lived at the time of Nicaea. In this reflection I am more interested in the pragmatic or utilitarian view of Santa Claus: why is it that people, even in this most sceptical of all ages, continue to promulgate the Santa Claus lore? What psychological or social function does Santa Claus fulfill for the modern world? The first thing to acknowledge is that belief in Santa Claus is not the same as belief in, say, the tooth fairy or the Easter Bunny. In the latter cases, even though parents will go along with the game and hide Easter baskets or sneak in to their childrens' rooms after dark to replace a tooth with a coin, there is a somewhat implicit understanding on the part of all concerned that these are just farces done for amusement. I don't know any child, either now or in my own youth, who mistook these games for reality; i.e., who really and actually believed in a literal tooth fairy or Easter Bunny. Santa Claus is on a higher plane than these two other folk beings. Parents really go to extremes to convince their kids that there is indeed a Santa Claus. First there is the hiding of the presents and putting them out Christmas Eve with tags that say "From Santa." That in itself might be no different than the parents pretending to be the tooth fairy. But it can go further - parents eat the cookies and drink the milk to give the impression Santa was there; they may go to other elaborate lengths, as my father did when he had a friend dressed up like Santa come to our house Christmas Eve when I was young so as to show me that Santa and my dad could not be the same person. Some parents fabricate sleigh tracks on the yard in the morning or go to other extremes of trickery to convince their kids that Santa is literally real. There is a constant verbal reinforcement, too. "Don't listen to what those older kids say, Billy; of course Santa is real!" People do not do this with the Easter Bunny; does anyone out there know of any parents who drop little rabbit turds around the house in an effort to convince their children that the bunny is a literal reality? But if you want the most convincing evidence of the bizarre way in which belief in Santa is treated in our culture, try going up in front of a group of kids and even in the slightest way insinuating that Santa Claus is not real. Be prepared for the ensuing firestorm (of which I have an unfortunate experience). Telling kids that there is no Santa is sure to bring down the wrath of outraged parents upon you, and they will no doubt say that you have no right to rob their children of their innocent belief. I agree with this, by the way; whether or not a family "does" Santa is between the parents and the kids. My point here is not to denigrate belief in Santa, but to demonstrate that it is in fact a true belief people try to instill in their kids and not just a simple game or fairy tale like the tooth fairy. Nobody gets angry if you tell them the tooth fairy isn't real. Santa is in a category all to himself. So why does culture put him there? And I mean not just Catholic culture, but secular culture at large, for Santa is a multicultural phenomenon. 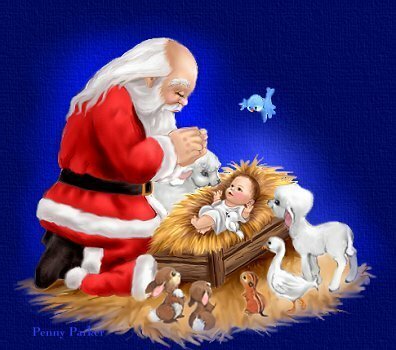 The belief in Santa that parents attempt to instill in their children is a type of faith. They want their kids to have faith in Santa's existence and take joy in seeing this faith lived out every Christmas. I would venture to say that there is something vicarious about the way parents enjoy their children's faith in Santa. Perhaps in a world when so many have lost faith or suffer from an inadequate faith, adults get a vicarious experience of childlike faith by witnessing it at work in their kids when they talk about Santa. Perhaps the type of faith that children have in Santa is the type of faith adults wish they could have about God. Perhaps in an age where faith in God is attacked from every front and it takes heroic virtue just to maintain fidelity to the fundamental moral teachings of the faith, those who find the struggle bitter also find that the simple, sincere belief in Santa exhibited by children is like looking back into Eden, a lost epoch of personal innocence that can never be experienced again, only relived vicariously in the innocence of others. One young person I talked to about this stated her observation that literal belief in Santa was more strongly instilled in families where the practice of the faith was weakest; conversely, in families of strong faith there was less of an emphasis on the Santa myth. Thus, (in her opinion) the zealous belief in Santa in some families is a compensation for a lack of robust faith in God, a kind of sentimental, natural replacement for the theological virtue of faith. I think this is too broad a statement to be of much value, for surely there are faith-filled families who "do" Santa and faithless families who don't. But I did at least find it an interesting attempt to come up with a psychological and spiritual cause for the Santa phenomenon. It is interesting to note that all the Santa films do place an emphasis on pseudo-faith; that is, on the act of believing over the object in which belief is placed. Kids are urged in these films (The Polar Express, The Santa Clause) to maintain faith in Santa or the "spirit of Christmas" above all else, as if the faith itself is the most important thing; one could contrast this with a Christian view, in which faith terminates in seeing and is a means to an end. A study of faith in Santa films could be an interesting post in and of itself, but I bring it up here only to point out the element of pseudo-faith (or perhaps sentimental faith) these films exemplify. In Christianity, there are certain things we hold to be objectively true, and thus we believe in them; in the Santa films, it is inverted to where the belief of the child somehow is connected with the reality of the object of belief. Take The Polar Express, where the child can only hear the bell if he "believes" he can hear it. Those who lack this amorphous "belief" cannot hear. If The Polar Express was a Christian film, the miraculous wringing of the bell would be heard by believer and non-believer alike, as glorious and unapologetic before an unbelieving world as the tilma of Juan Diego or the Shroud of Turin. People would come from miles around to hear the bell and it would ultimately wind up in a shrine somewhere with its own chapel and gift-shop attached. Please don't mistake my intent here. I too often find on this blog that when I am simply trying to explore or discuss an issue I get blasted for "condemning" something or taking sides. I'm not taking sides on Santa here; in my house, we go along with the Santa myth but my children also know it is only a myth, and that the real Santa was a Saint. I just think it's interesting that Santa is so sacrosanct in our culture that people will get quite angry at you if you insinuate to their kids that it is not true and will go to elaborate lengths to convince their kids otherwise. Is it a type of vicarious faith that substitutes for authentic faith? I don't know, but I do know that the true meaning behind all of our Christian holidays tends to get obscured by more popular folk traditions that have little to do with the Faith. As for me, though we do go along lightheartedly with the Santa myth (and I mean lightheartedly, as in, they know its not real), we make sure that Santa is unambiguously kept subservient to Jesus, just as the real St. Nicholas was subservient and humble before his Lord and Saviour. Congressman Ron Paul (R-Texas), perhaps the only person in Washington I actually have a positive admiration for, has recently introduced a new monetary bill that those Catholics of the Distributist persuasion might find very interesting. On December 9th he proposed the Free Competition in Currency Act, which would repeal the legal tender laws on the books in the United States, allowing citizens of the United States to accept other mediums of exchange besides the United States dollar, thereby giving people the power to reject the dollar in favor of other currencies if the dollar proves to be too weak. Paul put this bill before Congress once before, in December 2007, but has again reintroduced it as part of his on-going efforts to promote "sound money" in the United States (has anybody read his new book, End the Fed, by the way?). The bill has just be reintroduced; Sessions of Congress last two years, and at the end of each session all proposed bills and resolutions that haven't passed are cleared from the books, which means they have to be reintroduced again if a Rep wants to pursue them. You can read the full text of the bill here; it is only one page, which is a very nice change of pace compared to some other bills we've seen coming out of Washington lately. Legal tender laws mean that a government compels its citizens by law to accept a certain currency as the medium of exchange in all transactions. In the United States, our legal tender is the United States dollar, which must be accepted as a valid currency for all debts public and private. If you owe somebody money, whether the gas station clerk or your mortgage company, they must accept payment in United States dollars (there are a few exceptions - see here). We take this as a given in the United States today, but it was not always so, and the rise in "legal tender" laws corresponds directly to the degree that paper currency is accepted in place of precious metals. If we look back to the Middle Ages, currency was always in coin; and since the coin derived its value not from which kingdom minted it but from the content of precious metal it held, one silver coin from Byzantium was just as good as a silver coin of equal weight and content from Florence or England. Thus it was that an Spanish merchant doing business in Calais, France might use Greek numismata for exchange, or the King of England might have his treasury in Italian florins or Dutch guilders. These coins would circulate freely around the local and national economies, as all were equally recognized as currency because of their gold or silver content. This multiplicity of currencies left the merchant free to reject debased or worthless currencies. It was not unknown in the Middle Ages (and the ancient world) for rulers to shave their coins or debase them with other less valuable metals. So long as other currencies were circulating around in addition to these debased coins, merchants had a choice to accept or not accept the debased "official" coinage, since there were always alternate mediums of exchange to turn to. The problem begins when governments begin to turn to paper money as an alternative to precious metals, of which there is only a limited supply (and hence, precious metals can't be relied upon to fund enormously expensive and wasteful imperialist ventures). In America this grew out of the Civil War and the need for the federal government to find some means of financing the enormous costs of shouldering the war. This prompted Lincoln to enact the Legal Tender Act of 1862, which replaced the gold-backed Greenbacks with a note backed only by treasury securities; i.e., a fiat currency not backed by anything. This was certainly what happened during the Civil War when Americans were forced to accept first Greenbacks and then Legal Tender notes as currency. After the war, some wanted the legal tender system to be permanent; others argued it was only a necessity of the war and should be stopped. The constitutionality of the United States government printing paper money was challenged and in 1870 Hepburn v. Griswold, the Supreme Court ruled that parts of the Legal Tender Act violated the Constitution. As debates over paper money raged, concurrent with the silver controversy going on at the time, the Court eventually overturned the 1871 ruling and declared the printing of paper money and the establishment of a national currency Constitutional in Juilliard v. Greenman (1884). From thereon out, silver and gold were incrementally removed from circulation, culminating in the 1933 ban on private ownership of gold. Federal Reserve notes are not redeemable in gold, silver or any other commodity, and receive no backing by anything (source). Since the currency is not backed by anything, its stability depends solely on the soundness of the American economy, which is linked to the soundness of the government's fiscal policies. When the economy is good and the government policies are friendly to the economic system, then the currency will be strong and the legal tender system tends to work pretty well. However, the real problems arise when the economy takes a dump and the currency goes with it - then people find themselves having to pay debts incurred when the economy was strong with a currency that is weak. This is inflation, a lowering of the purchasing power of the currency as seen in a rise in prices. This problem is exacerbated when the government itself adds to the inflationary pressures by printing and circulating an extraordinary amount of fiat currency not linked to any real economic growth. At our current state, the American currency is being propped up only by the name and reputation of the United States government; if Egypt or Mexico or Peru or Pakistan tried running up a $14 trillion debt financed by fiat printing, their economies would crumble overnight, as did that of Zimbabwe (see here). Only America's longevity, historically strong economy and (presumed) financial stability are able to keep the value of the dollar up. But the world is starting to call these factors into question, and the dollar is weakening rapidly. If the world ever loses confidence in the American government, the inflationary pressures we have unleashed by printing so much money will catch up with us and we could experience hyperinflation. Inflation is a uniquely modern problem, at least in its swiftness and degree. Sure there was overall inflation in prices in Europe from 1500 to 1600, but it was gradual and relative to a real supply of specie in European economies coupled with a real increase in the costs of maintaining armies, navies, etc. in the 16th century. But the Middle Ages saw nothing like the inflation of Germany in 1923, or that of Yugoslavia in the 1994, Hungary in 1946 (with a monthly inflation rate of 4.19 x 10 to the 16th power % and prices doubling ever 15 hours) or Zimbabwe in 2008. Those types of crises require a fiat paper currency forced in place by legal tender laws. Those whose sole source of wealth is in legal tender suffer the hardest blow when inflation hits because they witness the devaluation of their money as it loses its purchasing power. What would we all do if, say in the next year or two, the American economy fails to pick up, US debt spirals out of control as the government attempts more failed stimulus spending into the tens of trillions and foreign markets and countries lose confidence in the US government? What will we do if our currency becomes worthless and inflates at an alarming rate? In the absence of legal tender laws, Gresham’s Law no longer holds. If people are free to reject debased currency, and instead demand sound money, sound money will gradually return to use in society. Merchants would have been free to reject the king’s coin and accept only coins containing full metal weight. Obviously Paul is referring to a currency in metal competing with a paper currency; his bill also calls for a return to private minting. Since the value of metallic currency was in the metal content itself, there was no reason why private mints could not exist alongside the US government mint in striking these coins - an oz. of silver was an oz. of silver regardless of who minted it. I can't see any reason why a Distributist shouldn't be open to this concept of having other currencies coexisting alongside our official currency. This was, after all, how most economies in the Middle Ages and the ancient world flourished, which of course were generally much more stable than ours. It would certainly put more power back into the hands of the people and promote localism if certain precious metal coins were struck by regional mints. Yet most Distributist stuff I have read seems to presuppose a single, legal tender currency and focuses mainly on how to manage the currency we have in an equitable and responsible manner. I am not really a Distributist - I am more of a semi-Distributist because I like the ideals of Distributism but have reservations about how it would be implemented, though perhaps these reservations are more due to ignorance than to any positive disagreement. I am also not in favor of a currency solely tied to the gold standard, either, because inasmuch as there is a limited amount of gold it can be manipulated by hoarding it or flooding the market with it. But I do feel that a mixture of paper currency coupled with precious metals would be ideal, and that the paper currency needs to be tied to growth and value in the real economy, not called up out of nothing. I am sure Congressman Paul's bill will not pass, just like his Audit the Fed bill will probably be doomed to failure as well (though I pray this is not the case). But it is interesting to think about - for those of you who know more about economics than me, what about this concept of other, perhaps privately issued, currencies circulating around in competition with the dollar? I think I just read the worst thing to be churned out of the anti-Christ, liberal-dominated mainstream media this year: an impassioned plea from a Canadian newspaper for the world to adopt a global one-child policy using China as the model. Click here to read this piece of garbage. I sent her one encouraging all liberals and globalists to take her advice, because if so, large Catholic families would inherit the earth in a few generations after these insane earth-worshipers contracept and abort themselves out of existence. Anyhow, please consider passing this email address and the article around to your friends (particularly those with large families) and blast this wacko's email with a slew of angry (but coherent and well-reasoned) emails. You are encouraged to post the text of your emails in the combox here. I'm almost through with a really great book called The Signs of the Times: Understanding the Church Since Vatican II by Fr. Richard W. Gilsdorf, edited by Patrick Beno (Star of the Bay Press, 2008). I was originally told about this book by our Music Director (see here) who had very high things to say about it. At first I thought it would just be another book chronicling the confusion and disobedience in the post-Conciliar Church, but upon reading it I was pleased to find that it is not your run-of-the-mill critique of the post-V2 Church. This book is quite unique and deserves to be read, even if you've already had a healthy diet of stuff like Liturgical Timebombs, Heresy of Formlessness and The Reform of the Roman Rite. The main value of this book lies in the fact that it is not reflective but is written "at ground zero", so to speak. What I mean by this is that though the book was published in 2008 (three years after the author's death), it is a collection of essays and articles written by Fr. Gilsdorf spanning 1959-1992, but most of them coming from the darkest period of the modern Church's history, 1975-1984. The essays were originally published in diocesan newspapers (Green Bay, Wisconsin) and chronicle the degeneration of the Catholic Church as it was happening. When reading Fr. Gilsdorf's book you don't get a reflective view of what did go wrong in the Church, but an alarmed first-person view of what is happening as Fr. Gilsdorf takes us through the 70's and 80's with all their chaos. The drafts of the articles were found among Fr. Gilsdorf's personal papers after his death and published posthumously. Several years ago on a dark and blustery late fall afternoon, I was called to the side of a man striken by a heart attack in a small crossroads village some 10 miles from my rectory. I found the victim lying on the ground outside a small cheese factory where he had been installing a cement platform. By the time I arrived, his wife and son, several fellow workers, and some neighboring farmers had gathered and watched in silence while rescue squad personnel attempted in vain to resuscitate him. The wife was in nigh hysterical state. Enter the priest, holy oil, and current ritual in hand. I immediately recited the conditional absolution from memory. Next, I recall frantically paging for the essentials of the rite, which I located at long last near the center of the book. Then, after the anointing in extremis, I hunted for the apostolic blessing. Having awkwardly thumbed back and forth through the book, I found it obscurely tucked near the index with the numerous other "meaningful" options. Finally, for the consolation of the family and friends, I fumbled through options A, B, C, D, and E at every stage of the rite, the wind tearing at the pages of my standard ICEL ritual book, hoping (and struggling) to discover some suitable prayers. That event was traumatic. It "raised my consciousness" as to the madness of the unpastoral aspects of optionalism (Pg. 177). Indeed, the entire book is written to highlight the plight of priests and the pastoral difficulties they encounter when trying to remain loyal to the Church and the Pope in an atmosphere of what Fr. Gilsdorf unapologetically calls "Modernism." The book sets up a dichotomy between what Father calls "Papist" priests and "Modernist" priests, in which the priest who remains loyal to Rome find himself a pariah within his diocese and sometimes in opposition to the Bishop himself. The most heart-rending passages of this book come when Fr. Gilsdorf describes the interior anguish priests go through when they find they have to choose between loyalty to the Bishop or the Pope. Fr. Gilsdorf is not a traditionalist; he is simply a priest who wants to do what the documents of Vatican II state and throughout his book, which begins in 1959 and ends in 1992, we share with him his dismay as one directive after another churns out of various diocesan bureaucracies contradicting the clear intent of Rome and the Council Fathers. He speaks about the abuses and the crisis not as a traditionalist urging a return to historical Catholicism, but as a pastorally oriented priest who simply wants what is best for his flock. In that sense, this book is a very strong defense of tradition due to its impassioned (and sometimes even coarse or harsh) denunciations of certain modern practices. Father pulls no punches and is not afraid to refer to people or organizations as modernists, heretics, wolves, hirelings and Judases. Most of the book was written during the early or middle years of John Paul II's pontificate, and the only thing to keep in mind is that the condition has gotten substantially better since those years. But overall Signs of the Times was a great book and a very balanced addition to other works on the post-Vatican II crisis because of its pastoral dimension and the first-person view it gives the reader, who watches the crisis unfold through Fr. Gilsdorf's own eyes. I highly recommend it and will have it linked up in the "Books I Have Read Recently" section. It has also gotten a great review at The Curt Jester (see here). Anybody out there from the Diocese of Green Bay who knew Fr. Gilsdorf? He sounds like an outstanding priest. Over the past several days I have been having a series of very rewarding conversations with an atheist friend on mine on Facebook. The discussions have not been combative or really aggressive, just plain conversations. He responds to my comments respectfully, asks good questions and is actually quite delightful to have a friendly debate with. We obviously seriously disagree on some things, and recently we had a little discussion over the nature of religious belief, or faith. There is no real opposition between religion and science, because there is no opposition between faith and reason. Catholic theology from Augustine and Thomas onward has always acknowledged that true scientific knowledge can never contradict revelation because both revelation and the laws of science come from the same God, who is Truth and cannot contradict Himself. Any apparent contradictions come from either a misunderstanding of what revelation is teaches or (more often than not) a defect in the conclusions drawn by science; this is especially true in the areas where the boundaries of science must be defined by a system of rightly formed ethics. In the end, there are no true contradictions because God, the source of all knowledge, is True and no untruth can be found in Him. My atheist companion disagreed with this statement and said that faith is indeed opposed to reason, because reason/science concerns itself with what is demonstrable and faith means believing something with no (or insufficient) evidence. This means that faith is unreasonable, and thus there is a true contradiction. I don't understand about there being another definition of faith, or a Catholic one. Nothing supernatural has ever been proven, so faith is still believing in something with insufficient or no evidence no matter how you cut it. So, what is faith? What does it mean to believe? I decided to do a bit of reflection and give an thorough answer on this blog rather than try to bang something out in a Facebook combox. I have disagreed with my friend's definition of faith as "believing in something with insufficient or no evidence." Therefore, what is a more accurate understanding of faith? Given that this is a dialogue with an atheist, I have chosen to pursue a more philosophical line of inquiry rather than a theological or biblical one, and therefore will be following basically the outline of Thomist philosopher Josef Pieper in his book Faith, Hope, Love (Ignatius, 1992). Were I pursuing a theological line of reasoning, I would have undoubtedly started with John Paul II's Fides et Ratio, but because we are talking about what we can infer without appealing to Scripture or revelation, I have opted for Pieper's philosophical approach. I like Josef Pieper's reasoning in this subject (and most others) because, like the great philosophers of old, he begins by looking at what men mean when they use the words "belief" or "faith"; not necessarily religious belief, but belief in general - what do we mean when we say we "believe" something? Let's look first at some popular notions of belief - for some, belief is an emotional conviction (according to David Hume) or a practical certainty about matters that cannot be justified theoretically. Some say belief is the subjectively adequate but objectively inadequate acceptance of something as true. Immanuel Kant said belief is "the acceptance of something as true on objectively insufficient grounds." These definitions, though they may be common usages of the word, are actually improper - not improper because theology deems them so, but even improper linguistically, as I will demonstrate. A first, preliminary (but not exhaustive) definition would be that belief is to take a position on the truth of a statement - it means we think a statement true. Both the atheist and the Catholic can agree that to believe means to assert that something is true; it is the considering of something as objectively existent. But we certainly can't stop there, for there is another point regarding our relation to what we believe in. Do we believe in things we know? It seems that when we use the word "believe" we are referring to something unfamiliar to us, or something that we do not have conclusive, experiential knowledge about. St. Thomas says, "Belief cannot refer to something that one sees...; and what can be proved likewise does not pertain to belief" (STh III, 7, 4). So there is an unfamiliarity - I do not "believe" that I am wearing a red sweater right not because I can clearly see that this is so - I know I am wearing a red sweater. I can only said to believe in something that I do not see, like saying, "I believe what my grandpa told me about his experiences in World War II." So belief is an assent to something that we do not know experientially. Yet here is our next element of belief: what we believe in, we believe in an unqualified manner and without reservation. Some might object to this, for as I pointed out in the beginning, people often improperly use "belief" to mean they do have a reservation, like if someone says, "I believe it to be so," meaning "I'm not sure, but I think so." For some, "believe" is equivalent to "pretend" (i.e., to "make believe"). Suppose you have a brother who went missing in a war and has long been assumed dead. Then suppose you run into a stranger who has just returned from many years of being a prisoner of war and claims that he your brother alive in a prison camp. Let's say his story matches up with what you know of your brother and there is an internal consistency to his story. However, in this case there is no way to factually check up on his story and especially upon the decisive factor - whether or not your brother is still alive. You are thus confronted with a decision: am I to believe or not believe the man's story? Am I to believe him or not? Here there is no word that is better used than "believe." Two things: first, one who believes deals not only with a given matter or proposition for belief, but with a given person. When we say we believe things, we really mean we believe what someone has told us about these things, since (as we have said above), believe concerns itself with things we have no experiential knowledge of. Secondly, and going back to our earlier train of thought, belief in the proper sense requires unqualified assent and unconditional acceptance of the truth of something. Suppose in the story above, you were to tell the stranger that his story intrigues you, but that since you don't have any means of checking the facts you can't be sure; you ought to be prepared for him to break in and say, "In other words, you don't believe me?" You might say, "Oh yes, I have full confidence in you, but of course I cannot be completely certain," the stranger might insist that you do not really believe him, and he would be right. To say "I believe you but I'm not quite certain" is nonsense. I either believe my grandpa's account of World War II or I disbelieve it. If I say, "Perhaps he is partially accurate, but I think he just as well could be inventing stories," then I am not demonstrating belief. I may be forming an opinion, making a guess, or an informed judgment, but it is not the same thing as belief. You either assent to the story about your brother or you don't, and reserving assent to the stranger's story is equivalent to saying you don't believe him. Therefore, true belief requires unconditional assent. As Bl. John Henry Newman said, "A person who says 'I believe just at this moment but I cannot answer for myself that I shall believe tomorrow,' does not believe." But this brings us to a seeming paradox in belief: how can this unconditional assent be justified when the believer admittedly does not know the subject to which he thus assents? Well so far our working definition of belief (just belief in general, not religious belief or "faith") is to believe someone and to believe something. The believer accepts something as real and true on the testimony of someone else. We should begin to see then that the decisive factor in belief is who it is whose statement is assented to; by comparison, the subject matter is somewhat secondary. I may believe things for a variety of reasons: suppose while driving home I see a big accident on I-96. When I get home, my wife says she also was out driving and saw the big accident. Now, I may believe what she says, but this is not true and "pure" belief because I also have some first-hand knowledge of the matter - I saw the accident myself. Belief itself is not purely achieved until someone accepts as truth the statement of one whom he trusts for the simple reason that the trusted person states it. If my wife tells me, "A traveling salesman came to the door while you were out," on what basis do I believe her? Because I have done a forensic examination of the porch and concluded that yes, in fact, a salesman has been here? No; my belief is based solely on the fact that my wife said it was so and I have trust in her. What she told me is somewhat secondary; the basis for the belief is in that she said it, not what she said. That doesn't mean I take leave of my senses - I believe what my wife says because it is she who has spoken, but that does not mean I accept unconditionally anything she says. Suppose I come home and she tells me that she has been visited by aliens who brought Abe Lincoln and Amelia Earheart into our livingroom and they all had tea together. Though my wife is generaly trustworthy, because she is only a fallible human there is the possibility that she could be deceived about things. The degree to which I believe her words is somewhat correlated to the trustworthiness of her character as I have come to know it (C.S. Lewis also made this argument in The Lion, The Witch and The Wardrobe). That being said, we can never truly be said to have faith or believe in any human person in an ultimate sense. To ultimately believe in somebody means we don't only believe what they say about a given matter, but have such an opinion of their credibility that we must believe everything else that they say. "Belief of such an extreme sort," as Pieper says, "such as involved in the expression 'believe in someone', can neither be practiced by mature human beings nor asked of them. The immature child believes what his mother says for the sole reason that she says it. But the very fact that the child has no other reason for regarding things as true is, precisely, the measure of his immaturity" (32). I believe what my wife says; I do not believe in her or have faith in her in the strict sense, because she, being human, is not of such credibility that every conceivable thing she could ever say would be immune from error. Belief cannot be demanded of man, as in totalitarian dictatorships where the dictator demands unconditional assent in all of the methods and programmes of the State in an absolutist sense. This demand of unconditional assent by one man/men to another signifies that something inhuman is taking place. "No mature man is so spiritually inferior or superior to another that the one can serve the other as an absolutely valid authority" (33). This brings up another element of belief: a free assent of the will must be performed. This cannot be otherwise. Acknowledgement of a plain fact is not free. Truth compels, and if I see that my sweater is red, I am compelled to admit it is so. But with belief (which remember, is referred to something we have not seen), the truth is not what compels us to accept to subject matter. In belief, the will is operative in a special manner - I might believe in something, and I might just as well not believe. It is a matter of the will, not of being convinced by an evident truth. I can will to believe the stranger's story about my brother in the prison camp; I might just as well not believe it, but I cannot will not to believe my sweater is red when it is evidently so. Now, if will is involved, then we must ask, towards what does the believer direct his will when he believes? If my wife tells me about the salesman coming to the door while I am out, and I believe her words, I am in fact willing the act of belief; to what is my will directed? "Towards the warrantor and witness whom he affirms, loves, "wills" - insofar as he accepts the truthfulness of what that witness says, accepts it on his mere word" (39). My will is directed towards my wife, willing to believe her. When I believe my wife's words, I in some sense participate in her knowledge of her experience. I was not present in the Po Valley Campaign of World War II, but when I believe and assent to his words, I in some way participate in the knowledge and experiences of my grandfather. I am placed in the condition of seeing something that would never be attainable by my own unaided sight, of seeing with the eyes of my grandfather, who saw directly. So belief does necessarily imply a relationship - just like you can't have belief if there isn't someone who is the believer, neither can you have it without someone who actually knows. The knowing is actually prior to the belief. "Wherever belief is meaningfully held, there is someone else who supports the believer; and this someone else cannot be a believer" (42). Vision, direct knowledge, is surer than hearing or belief (visio est certior auditu). Then why do we settle for belief, for hearing, when we know that vision or direct knowledge is surer? After all, given a choice between hearing about something and seeing it directly, who would opt for just hearing? Given a choice between belief and knowledge, who would opt for belief? But suppose our situation is that we can't choose? What do we do if our choice is either no access at all or only partial access, incomplete knowing or complete ignorance? Though knowing is surer than hearing, who would not choose hearing if the alternative was nothing at all? I would like to know what it is like on the moon. But since I shall most likely never be able to go, the best I can get is to hear from someone who has been there about what it is like. This is the closest I can get to experiential knowledge. Do I want to get an incomplete picture from another or go without any picture whatsoever? This is the dilemman any man must confront when deciding between belief and nonbelief. If this is our situation (and theologically, I would say it is, since none of us have a direct vision of God), then belief is the most certain form of assent we can give. Therefore, it behooves us, when we believe anybody about anything, to make certain that the one we believe has an authentic knowledge about those things that we believe on faith. Have you ever noticed how no argumentation, no matter how compelling, can ever convince someone else to "believe" you? There is a strong element of credibility - credibility of the witness, the credibility of which makes what he says credible. So we have to be convinced of the credibility of the witness. But how? This is a problem, because the conviction of the credibility of the witness cannot itself be belief - the credibility of the witness cannot itself be a subject of belief; this is where real kowledge is required. The premises of belief cannot be the object of belief; if everything is said to be belief, then authentic belief is eliminated. As the Scholastics would say, "Cognito fidei praesupponit cognitionem naturalem" - Belief does not presuppose knowledge based upon belief in its turn dependent upon someone else, but rather knowledge out of one's own resources. In Catholicism, we have so-called "motives of credibility," reasons given to give assent to the proposition that God has revealed Himself to mankind. As we are discussing belief in general and not necessarily theological faith, I will pass over these for the time being. Going back to the certainty of belief: we have stated already that belief, by its nature, must be unqualified and certain. But knowledge, which is superior to belief, is also certain. If knowledge and belief are both certain, is there a difference in the types of certitude? In fact there is, because the certainty of belief is mixed in a curious way with an element of imperfection, or uncertainty. How can this be so, since we have already stated above that belief must be certain in an unqualified sense? Well, the perfection of the certainty inheres in the firmness of the assent, and hence it is true that the assent of belief is unqualified. But insofar as no vision operates, insofar as knowledge is lacking, there is said to be an imperfection in belief. This is the teaching of St. Thomas (De Veritate, 14, 1,5), who said that this causes the believer to at times be troubled by a lingering mental "unrest" (inquietus). It would be wrong to associate the "disquietude" with doubt, however. What is meant by unrest is a "probing consideration, conferring with oneself before deciding, being on the track of, a mental reaching out for something not yet finally found. These processes, alone or taken together, constitute this "mental unrest." Therefore the believer is characterized by linking the final, unqualified assent with a residual unrest that seeks to further ground his belief. I must again stress that this "restlessness" is not the same thing as doubt. It is the restlessness Saint Augustine spoke of when he gave us his famous saying, "Our hearts are restless, Lord, until they rest in Thee." Or, in the words of Pieper, "Once I regard the news [that which is believed on faith] as unconditionally true, I am tormented by the need to form a picture of the reality that is both revealed and concealed by the news. And at the same time I know that I shall never succeed in doing that...the believer is bound to be restive in this sense" (53). Or Aquinas, who says, "The cognition of belief does not quiet the craving but rather enkindles it" (CG, 3,40). To move into the realm of faith, or religious belief: we still have a fundamental definition of belief that is true even in a religious context - to accept something unconditionally and real on the testimony of someone else who understands the matter out of his own knowledge. This is a good, solid definition of faith, and not that far removed from the one given us in Hebrews 11:1: "Faith is the substance of things hoped for, the evidence of things not seen." Notice that this faith is substantial and evidential; it is not belief in the face of no evidence, as my atheist friend suggests, but belief on very substantial evidence, the substance of which is grounded in the credibility of the informant, or he in whom the faith is placed. The difference between everyday belief and religious belief is, of course, that the one we put our belief in, the Someone whose testimony we accept, is God Himself. We believe in God, and as this belief is based on the credibility or the character of the one in whom we believe, we can have total belief in Him because His nature is perfect. Thus God can be the object of a kind of belief that we can never direct towars a human being (as stated above). There is a huge problem though - how can the believer justify the necessity of believing in God? Or to put it more philosophically, why is man's nature and situation such that he cannot make do with what is naturally accessible to him? Why should we be dependent upon information that we could never find and that, even if found, is not susceptible to rational examination? We are summoned to accept as true a set of facts we cannot examine, referred to a witness who does not meet us directly and demanded a kind of absolute and unconditional assent that we are prepared to give in no other case. This "nonexaminability" lies in the nature of the message as well as the nature of the recipient. No man can fully examine, evaluate and exhaust the message that God has become man in order to reconcile man to God. The message is too grand and beyond our capacity to fully understand, and we are too finite to fully comprehend such a cosmic truth. Hence we return to mystery - those truths which go beyond our reason but do not contradict it; things which lead us to the threshold of rationality but then take off beyond where our reason can follow. The skeptic would say that, given such a situation, we should just suffice with what we have according to knowledge, after the proposition, "Where knowledge suffices we have no need of belief." Here is the problem with this statement: By what marks do we recognize where knowledge suffices and where it doesn't? No one can say without also considering what it is to suffice for. Therefore, if anyone asks whether what is known only naturally to man should be sufficient, he must first formulate what he considers meaningful in human life. This is a question that has to do with the metaphyiscal (or non-metaphysical) nature of man, depending on your viewpoint. The skeptic who says natural knowledge alone suffices has already determined that nothing beyond what is natural is important in life, and hence argues from a position he has already adopted de facto. This is no different for the believer - by saying that natural knowledge alone does not suffice, the believer has already come to the conclusion that his own "natural" knowledge is not enough for him. Thus, this question about whether or not science or natural knowledge suffices has to do with our conception of man as a being and of what his true needs are. But I would say that once we conceive of a God, a God who is a personal being, a Someone rather than a Something, there is no way to rule out revelation. This post is not about proving God's existence but on the meaning of faith - and remember, for one to have belief, to be a believer, there has to be a knower who stands behind the believer. If God has spoken, and we have received the message, there is nothing supernatural about the receptivity per se; it belongs to the human being's natural state of mind to be receptive to the message of others. The difference lies not in the mode of reception but in the origin of the message and the nature of the message - this is why the Word of God, though eternal and perfect, comes to us through human channels like other human speech, written (or spoken) in the words of humans. The soul is by nature capable of receiving supernatural graces - belief in revelation is in a certain sense natural. "Not only can man be expected to believe, but not to believe would be downright contrary to human nature - if God has spoken to man in an audible fashion" (63). One who conceives of God as Someone capable of speech and man as being receptive to God must necessarily regard revelation as possible, but it does not follow that revelation has actually taken place. How can we discuss the actuality of a divine revelation to someone who, on the basis of his conception of God and man, denies its very possibility? I don't see much ground for dialogue here. For any meaningful debate to occur, there is presupposed a common ground that both sides agree to. For example, Protestants and Catholics both agree that the Bible is the word of God, and so a Cath-Prot debate can legitimately use the Bible as a point of reference. But in a disussion about belief, if one party does not believe in any God and the believer does, what common point of reference can there be? The ground for the believer is in the authority of the One who speaks (God), while for the non-beliver the foolishness of belief is in the very assumption that this God does not exist. Thus I see that the two cannot really have a debate about belief, in the sense that one can convince the other from his own store of proofs; for the Christian at best, there can be a dialogue or explanation of the term "belief" (which I have tried to do here). Hence the saying of Aquinas, "The Christian who wishes to conduct a disputation on his belief should not attempt to prove his belief but to defend it" (Rat. fid., cap. 2.). One final word - our faith in the Church and the revelation of God should not be considered "blind faith", even though it may be "implicit faith." Implicit faith occurs when someone asks another, "What do you believe about such-and-such?" and the other replies, "I believe what the Church teaches." This is said to be fides implicita. For the modern man, this answer would invoke ridicule, although really there is nothing nonsensical about it. Suppose you are going in for a major heart operation and someone asks you, "How are you going to have the operation performed?" You shrug and say, "I'm going to go with whatever my heart surgeon wants to do." Is there anything naive or simplistic in such an assertion? Remember, the belief is only secondarily about the propositions believed and primarily about the authority/credibility of the one in whom belief is placed. This is the operative prinicple behind the fact that most people willingly assent to everything their doctors propose for the even if they understand very little of the terminology or particulars. There is implicit faith in the doctor, a faith that trusts and assents to what he says because he says it. This faith is not blind - in fact it is well informed, so well informed that we know that it is best for us to stay out of the way and let the doctor do his job. But when it applies to God, how do we recognize that something that lays claim to divine revelation is really of divine origin? Since belief cannot be its own ground of belief, the believer must be able to answer this question by rational argumentation and a knowledge that is truly his own. The methods and possible means of certainty that exist are so manifold that they could not possibly be exhausted here - some arguments have more weight with some than with others, and there are as many modes of apprehension as there are people on the earth. Perhaps in the future I will take this argument to the next step - what are these "motives of credibility," these rational, logical facts based in our own knowledge that give rise to the belief that revelation has happened and that it has come down through the Catholic Church? But here I have sought only to explore, philosophically, the nature of belief and I hope this suffices for now. So, to my atheist friend, belief, even in a natural setting, is something much, much different than "believing in something with insufficient or no evidence." Faith is to accept something unconditionally and real on the testimony of someone else who understands the matter out of his own knowledge and really has nothing to do with whether or not there is "evidence", because the ground of faith is not in the evidence but in the word of the knower in whom faith is placed (in our case, God). Western civilization is something that is dear to the heart of any orthodox Catholic. A large part of the crises of the modern world consists in the fact that our civilization seems to have forgotten its heritage and in a sense committed cultural suicide. It is interesting to note that if you spend any time reading conservative publications or listening to conservative pundits, you will hear the phrase "Western civilization" thrown around a lot as well. On the surface, these conservatives say a lot of things about "Western" civilization that a Catholic could agree with: that it is a good, that it must be protected, that it transmits everything valuable from our forefathers, that there is a culture war on today, etc. But further reading and digging into what exactly is meant by "Western" culture reveals that the Western culture the political neo-cons are so gaga about is not really the same Western culture the Catholic is concerned with restoring. Many of the secular defenders of "Western civilization", such as Mark Levin and Sean Hannity for example, see Western tradition as being embodied in the principles of the United States and having their origin in the Enlightenment. The source of our civilization, for these pundits, is not Catholicism or the united Christendom of the Middle Ages but the ideals of men like Rousseau, Jefferson, Locke and Thomas Paine. 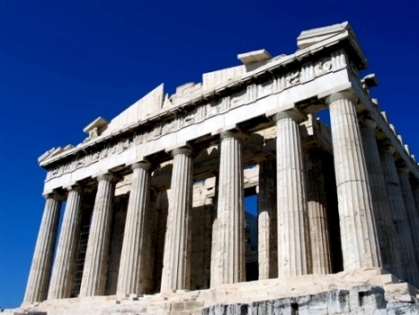 Occasionally there is a reference to Greece and Rome as important contributors, but by and large you will find the opinion that the greatness of Western civilization begins with the modern period. Lest I make this observation without properly giving examples, let us consider three. The first time I noticed this emphasis on the Enlightenment as the origin of Western civilization was in the famous book Closing of the American Mind by Alan Bloom (1987). In this book Bloom points out the degenerate nature of modern culture and the bankruptcy of American institutions in truly educating students. He blasts relativism and modernity unrelentlessly and according to some fired the first shot in "culture wars" of the past several decades. Yet if Bloom calls the modern American lifestyle degenerate and our educational system bankrupt, what is the standard to which he is comparing it? One finds this standard in the Enlightenment philosopher Jean-Jacques Rousseau, whom Bloom quotes extensively throughout as one of the founders of Western cultural thought. Though he cannot really be called a conservative, another critic of the modern age who adopts this idea is famed cultural historian Jacques Barzun, who penned his famous From Dawn to Decadence: 500 Years of Western Cultural Life in the mid-1990's when he was close to ninety years old (by the way, he is still alive and is 102). This book purports to trace the fate of Western civilization from its origin to, in barzun's opinion, its collapse into mediocrity in the modern age; hence the title, From Dawn to Decadence. Where exactly does Barzun put the "dawn" of Western civilization? Not at the Enlightenment, but with Martin Luther at the Protestant Revolt. Thoug Barzun, like Bloom, will go on to see Western cultural blossom and grow during the Enlightenment, he sees its origins in the ideals of the Protestant Revolt, specifically with Luther's rejection of ecclesiastical authority and the idea of religious liberty (which is ironic because those of us who know Luther know that he was no fan of religious liberty). For Barzun, Western civilization emerged out of the mire of the Middle Ages during the Reformation, grew into maturity at the Enlightenment and fell into decadence in the period after World War I. Everything good about the world (including reason, scientific advancement, political ideals and capitalism) Barzun attributes to the Enlightenment. As a third example of this conservative idea of Western civilization as being embodied in the Enlightenment, we could quote any one of the string of conservative professors and speakers who are regularly featured in the publication Imprimis, which many of you are probably familiar with. Imprimis is a monthly publication put out by the ultra-conservative Hillsdale College of Hillsdale, Michigan, only an hour south of me. It boasts a readership of 1.8 million and is given out for free to anyone who signs up for it. Wait a minute, where did it come from? Let's look at that again: we refer to the culture that originated in Greece, spread to Rome, permeated Northern Europe, was incorporated by the Anglo-Saxon tradition, spread through British expansionism. Was there not any other stages between the Anglo-Saxons and British expansionism? The Anglo-Saxon tradition, at best, can be said to be dominant from the 6th century to the 12th century, and British expansionism didn't begin in earnest until at least 1600. That leaves out everything from around 1100 to 1600; i.e., the Middle Ages. Notice also the Anglo-centric view of Western civilization - why does he say the culture of Greece and Rome "permeated northern Europe" and then went into Britain? What about Spain, France and Italy? Didn't they share in Western civilization? I think it is ridiculous to speak of the Western tradition as "permeating" northern Europe while leaving out any mention of France and Italy. Those, of course, were the countries most wedded to Catholicism in the Middle Ages. And what are Western ideas? This question is disputed, but I think we know them when we see them. They include a commitment to constitutional or limited government, freedom of the individual, religious freedom in a sense that precludes religious tyranny, respect for property rights, faith in free markets, and an openness to rationalism or to the explanation of natural phenomena through reason (source). Not all of these are bad or anything a Catholic would necessarily disagree with, but we cannot deny that they are all ideals associated with the Enlightenment. Constitutional government? Free markets? Rationalism? These are not the characteristics of the Middle Ages, to be sure. Like many other conservatives, Dr. Hanson sees the origin of Western civilization as bound up with the ideals of the 17th and 18th centuries, the same period that gave us the French Revolution, anti-clericalism, Deism and ant-supernatural rationalism. For many conservatives, this period of the glory of Western civilization. So why is this important? Maybe it's not, but it is of interest, especially if we find ourselves standing shoulder to shoulder at times with conservatives in defense of "Western" ideals. So what is so valuable about Western civilization to these conservatives? I mentioned Mark Levin earlier; on his show he regularly discusses the blessings that Western civilization has brought about, which he sees as concomitant with capitalism. Some of these blessings of Western civilization are the abundance of wealth in the world today, the high standard of living, the technological advancements of the modern age, and the "liberty" enjoyed by Americans. In other words, these are all purely material benefits. Many of these "benefits" I do not even think are unqualified benefits at all. The highest level of prosperity ever seen in the history of the world? Also the highest level of materialism, which no one can deny is a result of consumerism. Sometimes, when I hear Levin talking about what his ideal of "Western" civilization has procured, I think that some of these things are responsible for the cultural quagmire we are now in. Then what is Western civilization, from a Catholic viewpoint? For me the glory of Western civilization is not in the writings of Locke and the principles of the Constitution but in the courts of Charlemagne and the cathedrals of Chartes and Notre Dame; it is not found in the radical liberty proposed by Martin Luther but by the harmonious relation between faith and reason as found in Aquinas; it is not in the cold rationalism of the Deists but in the mystic spirituality of the saints; not in the imposing neo-classical hulks of Washington D.C. but in the splendid gothic works that still dot Europe. For the Catholic, the Middle Ages embodies Western civilization, which is a religious and cultural ideal;, complete with the union of throne and altar; for those mentioned above, Western civilization is a reaction against that ideal. For the Catholic, Western civilization declines with Luther; for the political conservative Western civilization begins with him. For the Catholic, everything bad about the world comes after 1500 while for those above, everything valuable is found in those unhappy centuries after Luther. For one the standard is a united Christendom under the popes; for others it is the Founding Fathers and the Enlightenment principles of government. For one it is a religious ideal, for others a secular and political one. For me, Western civilization means nothing other than Christendom. For some, Western civilization is what is built up on the ruins of Christendom. I think this distinction is very important, and we need to keep it in mind. Those who advocate a return to "Western" tradition are not really our friends if they are referring to this secular concept of the West as found in the Enlightenment. This view of Western civilization is completely divorced from Catholicism, as evidenced by Dr. Hanson referring to the largely pagan nations of Japan, South Korea and Taiwan as "Western" also because they have adopted "Western ways"; i.e., capitalism. I for one am not praying and fighting to save the anti-Christ ideals of the Enlightenment, but to promote Christianity and a Christian culture, poltically, socially and economically. I refuse to allow "Western civilization" become a code-phrase for American capitalism. But let us remember that there is no civilization at all without religion, no culture without cult, and no Western civilization without Roman Catholicism. Our point of reference should not be the Enlightenment, one of the most decadent and wicked periods of human intellectual history, but in the beautiful unity of spiritual and temporal that was the glory of the Middle Ages. We know as a matter of faith that hell is real and that, unfortunately, there are some among the sons of men who will reject the grace of God and end up in this unhappy place. All loyal Catholics ought to ardently reject any teaching that hell does not exist, or that it does exist but is empty, as von Balthasar proposed. Hell does in fact exist and there are some unhappy souls among its number, along with the devil and his angels. However, and paradoxically, we know that God wills that all men come to a knowledge of the truth and be saved, as it says in 1 Timothy 2:4, "[God] wills all men to be saved and to come to the knowledge of the truth" (qui omnes homines vult salvos fieri et ad agnitionem veritatis venire). Despite the fact that God wills for all men to be saved, since He has made this salvation contingent upon the free will and cooperation of mankind, it happens that there are in fact those who are not saved. Some use the free will granted by God to reject Him and thus choose eternal destruction. Nevertheless we still ought to pray that, insofar as is possible, all men come to the saving truth and attain heaven. While I acknowledge that not all will be saved, I, with the Father, will that it would be so for all men and pray that everyone would accept Him. Some radical Traditionalists take offense at this, deeming it an acceptance of "universal salvation" to even so much as pray that all might be saved while we know in fact that they won't. I have never seen how praying for all to be saved implies universal salvation if God Himself can will all men to be saved even though they aren't. If God Almighty can say "I will all men to be saved" then I don't see how anyone can take offense that I simply pray that this might be so, even though it won't happen ultimately (kind of like when we pray for "peace on earth"). And so when we hear and read in the sacred scriptures that God wills everyone to be saved, although we are certain that not everybody is saved, we should not for that reason envisage any limitation to the will of the Almighty God, but understand the words of Scripture who wills everyone to be saved (1 Tim. 2:4) as meaning that nobody is saved except those whom He wills to be saved, not because there is nobody whom He does not will to be saved, but because nobody is saved except those whom He wills to be saved, and so we should pray Him to will, for what He wills must necessarily come about (Enchridion on Faith, Hope and Charity, 27). By praying for all men to be saved, we pray that those who will respond to God's grace may come to attain that grace and thus be among those whom He wills to be saved - our prayers truly make a difference. One problem with saying we ought not to pray for all men to be saved is that out of all men we do not know who is on the road to heaven and who is not, and this information is deliberately concealed from us. If we withold prayers from anyone on the premise that "some aren't going to be saved and so we shouldn't pray for them," how do we know we are not witholding prayer from one who would have responded positively to God's grace had we prayed for them? Our prayers can be powerful and effacacious, and for this reason we ought to always pray that insofar as is possible all men from the rising of the sun to its setting come to love and adore our Lord Jesus Christ and be saved. We know that in the end some will be deceived by the wiles of the devil, but I don't see any valid reason why we shouldn't pray for God to extend His mercy as broadly as possible nevertheless. Therefore I see no reason to heed the advice of some of the more radical Traditionalists in failing to pray for all men (some even reject Fatima because of the invocation "lead all souls to heaven") - such a prayer in no way teaches universal salvation and in the end, I'd rather pray too much for those who reject it than be guilty of not praying enough for those who could have benefited from it. When some radical Traditionalists say to me that they don't pray for all because all won't be saved, I ask them, "And who is it exactly that you want to go to hell?" They inevitably (and rightly) respond, "I don't want anybody to go to hell", then I say, "Then why not pray as you will?" I think this is common sense and I believe we are actually compelled to pray for the salvation of all, as St. Paul commanded, "I exhort therefore, that, first of all, supplications, prayers, intercessions, and giving of thanks, be made for all men" (1 Tim. 2:1). If there is one thing this sick, weary world does not need, it is for Christians to stop praying for people under the pretext that it's not going to do anything. That is a lie from the pit of hell. I normally don't do book reviews on here, but I recently picked up a great little book on the Mass that I recommend highly. Praying the Mass: The Prayers of the People by Jeffrey Pinyan of the blog The Cross Reference is the best book on the Mass that I have seen in a while, especially because it is the only one that has been written in conformity with the new English translation of the Mass that should be implemented next year. This alone sets it apart from all other books on the Mass currently floating around. Jeff's book is meant for those who want to get deeper into the Mass - essentially, it's a practical guide to true active participation and a welcome counter to tired out old activist notions of participation that became dominant in the post-conciliar years. This would be an excellent book for friends or family who have some knowledge of the Mass but want to learn how to go deeper. I purchased twelve copies to give out to my RCIA class when we talk about the liturgy. If you are already a liturgical expert, then this book probably won't tell you anything new, but it would be great to have on hand to give to persons who might have questions about what goes on at Mass and why we do what we do. The book seems to be written to help promulgate a more reverent participation and conscious reflection on the Mass, in keeping with the wishes of our Holy Father to restore dignity and solmenity to the celebration of the Roman Rite. The book takes you through each part of the Mass chapter by chapter, drawing out the pertinent theological observations and backing them up with citations from the CCC, the Popes and Scripture. The Mass prayers themselves are provided in Latin with the corresponding, correct English translations (the ones that will be coming out soon) next to them. At the end of every chapter are a series of thoughtful questions and reflections designed to help the reader put together the various themes brought up in the course of the chapter. Jeff's writing is clear and insightful (as you can see from his blog) and his observations and theology all perfectly in line with a traditional understanding of the Mass as a Sacrifice. The book is written about the Novus Ordo, but he frequently refers the Extraordinary Form as a reference point and reminds us that the Extraordinary Form is a valid and praiseworthy expression of the Roman Rite, echoing Benedict's words in the motu proprio. I recommend this book highly. You can click here to go to the book's website for reviews, excerpts, etc. and of course to purchase. This weekend the 40th anniversary of the institution of the Novus Ordo Missae by Pope Paul VI, which was instituted on the First Sunday of Advent in 1969. For several years now, since I began this blog in fact, I have identified myself as a "traditionalist", inasmuch as I not only love and revere the traditions of the Catholic Church (which, by the way all Catholics ought to do), but that I think that the Church has in many ways abandoned much of her tradition in the past several decades and would do better to reconnect with it. This disconnect with tradition is what many refer to as the "liberal crisis" in the Church. There are many different positions within a traditionalist spectrum, and I certainly disavow any positions that are of a more radical nature - I think sedevacantism is crazy. 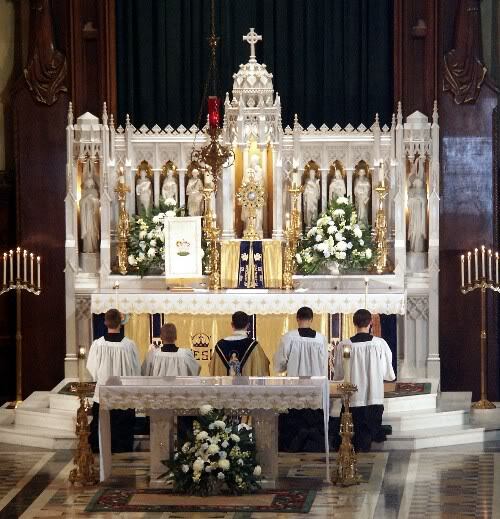 I do not think it is okay for Catholics to go to SSPX chapels if they are in a state of schism (I say if, because apparently there is some ambiguity involved). I completely acknowledge the NO as a legitimate expression of the Latin Rite and adhere to everything taught in the CCC, Vatican II and the papacy. The pro multis/for all debate is a non-issue for me. My family wears head coverings but I don't get bent out of shape at people who don't (although I think there is a strong argument to be made that women are supposed to be wearing them still). I attend a parish where the NO is celebrated reverently, ad deum and with most of the fixed parts in Latin. I'm not what is popularly referred to as a "rad trad." I try to be optimistic, remembering the virtue of hope and the promise of Christ that He would guide and protect His Church. I have gotten some opposition in the past for making use of labels which are perceived as unhelpful and divisive. I do think that labels are a good thing - they help us to draw distinctions and see order in things. I have argued that labels are necessary, and that if they didn't fulfill a valuable function nobody would in fact use them (see here). An interesting thing about labels is nobody minds labelling other groups but seems to get upset if they are labelled. Mainstream conservative Catholics have no problem identifying a particular parish or liturgy as "progressive." Homeschoolers are labellers, very quick to group kids kids according to whether they go to public school or are homeschooled and make decisions about who their own kids can fraternize with accordingly (and I, of course, a homeschooler and do this myself and think there is nothing wrong with it). These practices are not wrong, and those who engage in them consider them quite necessary. Of course not all public school kids are bad influences, but because nobody has the time to examine each case individually, we make a blanket judgment using a label that helps us to draw practical conclusions without having to delve into each individual case. Back to the liberal crisis. I think one issue that kind of distinguishes the conservative from the traditionalist is how one deals with the liberal crisis. Everyone knows and acknowledges that liberals infiltrated the Church hierarchy and seminaries in the 40's and 50's and managed to hijack the implementation of the Second Vatican Council. Here I think a person like myself and most mainstream Catholic apologists would be in total agreement. The difference comes (in my opinion) in how one deals with this crisis. I feel that not only has the Church been crippled by a liberal crisis, but that the Church's response to liberalism has also been tainted or weakened by compromise with liberal principles. In the 1960's, the Church faced an onslaught from the rising anti-Christian sentiment of that worst of all decades. In America Mass attendance was strong, but in Europe, still recovering from the economic and moral catastrophe of World War II, Mass attendance was already very low - I read somewhere that it was down to 2% in Spain in the 50's? Don't know if that is true, but it is a fact that Europe was already dying when the American Church was still vibrant. Many in the Church, for various motives, believed that one reason the peoples of the West seemed disenchanted with Christianity was a perceived inaccesibility in the Church's worship. The celebration of the Mass was too distant and irrelevant to the daily turmoil of the average Christian, and so, they reasoned, in order to involve the laity better in the Christian life it would make sense to bring the Mass down to a level they could more easily grasp and identify with. To be fair, many of the reformers thought this would be an even trade: sure, there would be a simplification of the Church's liturgical rites, a "dumbing down," but most of the reformers who were sincere believed that in simplifying the liturgy they would attract much more interest and participation of the laity, who would then reinvigorate the worship of the Church and cause the liturgy to be more satisfying spiritually and intellectually. Some of the reformers (de Lubac, et. al) later saw the dangers inherent in this view, but at the time it was seen as a positive good by many to simplify the liturgy. This was viewed in terms of "restoring" the Roman rite to its pristine and antique dignity. Of course, this revised liturgy ultimately became the Novus Ordo Missae of Pope Paul VI. The status of the Novus Ordo is an important bone of contention between traditionalists and more mainline conservative Catholics. There is, of course, much more to traditionalism than just disputes about the Novus Ordo, although that is usually front and center. "I used to defend Vatican II by saying, "I know there have been abuses done in the "spirit" of Vatican II, but the Council itself was necessary,"; now I believe the entire Council was utterly unneccesary and...wish to God it would have never occured." I still believe that the Second Vatican Council was unneccessary and most of the legitimate reforms envisioned by the Council Fathers probably could have been carried out without the necessity of calling a Council. How do we know this? Because most of the changes in the past 40 years have indeed come after the Council. If radicals could cause so much chaos in the aftermath of the Council by committees, diocesan bureaucracies and the like, don't you think any legitimate reforms of the Church's life that would not have been so drastic could have likewise been carried out without a Council? "The Novus Ordo, while being a valid form of the Mass validly promulgated by the legitimate Second Vatican Council, was nevertheless a terrible idea. Not only the abuses but the Mass itself are wrought with grave omissions and ambiguities. The Traditional Mass of Pius V should be the normative Mass of the Roman Rite . . The surest route to a true restoration of Catholic Tradition is to restore the Rite of St. Pius V (ie, of Gregory the Great) as the missa normativa of the Roman Rite." Like many traditionalist minded bloggers who took up blogging to vent their frustrations about the state of the Church, my earlier posts (this was from Nov. 2007) were partially motivated by anger and discontent, which are not good dispositions to have when you go posting stuff online! Had I written this post today, I would not have used such strong language, such as "wish to God [the Council] would have never occurred." However, I still believe that the Second Vatican Council, while I acknowledge everything it taught, represents a error in the prudential judgment of those running the Church in 1958. Is this heresy? Dissent. I don't think so. To look at a fact of Church history and say "things would have been better had such-and-such never occurred" is not dissent or heresy - it is a judgment about the prudence of something, and we are all free to debate whether certain actions of the Church or hierarchy are prudent or not. I am faithful to the Church's discipline, and discipline says that communion can be received in the hand. I therefore have no right to deny what the Church allows - but I can say that the decision to make this allowance was a mistake, and even go so far as to say that it would be better had it never happened. While some may disagree with me on these types of arguments (and I think with regard to this most orthodox Catholics are on the same page at least), but we don't need to accuse each other of infidelity or dissent when we are simply giving our informed opinions on prudential decisions. The Novus Ordo and Vatican II are obviously much broader topics, but I think the same principle applies. The timing was bad, despite the intentions of the Fathers. The mood of the Council was permeated by liberalism and the orthodox schemata were all systematically scrapped by a theologically progressive body of periti. Remember, the chaos following the Council was the result of implementation after the fact, but the liberal agenda was there from the first meetings of the first session. Until recently, the forms of worship adhered to the Tridentine dictates of the Roman Catholic Church and reflected the Tridentine spirit of the church under siege by heretics...Happily, in the 1960's Pope John XXIII declared that the war and the siege were over. Vatican II was perceived and still is perceived as a new beginning for the Church, completely cut off from what came prior. Not only did error and abuse creep in after Vatican II, but in the example above Vatican II is cited as the reason for these abuses. We can't go on forever just saying that the Council was "hijacked" after the fact - anybody who knows the history of the Council itself knows that the hijacking began on day one of the Council, not after it was closed. The silencing of Cardinal Ottaviani, the throwing out of the original schemata, the restructuring of the way the members of the committees were chosen - all of these occurrences point to a hijacking of the Council itself and occured in the very opening of the Council. The proposed revision of the liturgical rites was part and parcel of this hijacking. I completely believe in the legitimacy of the Novus Ordo, but given what occurred prior to, during and after Vatican II, I have no regret in saying that this Council should never have been called. This new liturgy should have never been promulgated. Whatever good intentions or hopes the liturgical movement and the Fathers of the Council had for these things has been swallowed up in a sea of confusion, discord and abuses. Trent solidified and consolidated the ranks of the Church - why did Vatican II destabilize them? Let's say, for the sake of argument, we may have needed some liturgical reform - could it not have been brought about in a more gradual, organic way than the way it was? Was a Council necessary? Suppose I go for a trip to the grocery store. Suppose on the way to the grocery store, I get in a car accident and trash my vehicle. Seeing the calamity that befell, I muse to myself, "It would have been better had I never made that trip. I should have stayed home." Is the trip itself bad? No - there's nothing wrong with going to the store. But regardless of whether or not it was okay to go to the store, the destruction that ensued as a result of me making the trip is enough to justify my assertion that it would have been better had I stayed home. "Whoever accepts Vatican II, as it has clearly expressed and understood itself, at the same time accepts the whole binding tradition of the Catholic Church, particularly also the two previous councils . . . It is likewise impossible to decide in favor of Trent and Vatican I but against Vatican II" (The Ratzinger Report, San Francisco: Ignatius, 1985, 28-29, 31). I cite this passage because it was once produced against my opinion to try to show that you cannot be a good Catholic and at the same time say that Vatican II was prudentiall a bad idea. I see no conflict with the Cardinal's statements and agree one thousand percent, if we are speaking on the level of authority. Vatican II is an ecumenical council the same as Trent. But two things need to be pointed out - the fact that all Councils are equal in authority does not mean all produce equally good results and that we need equally acclaim all Councils as equally good and prudent. Lateran IV is called the greatest council of the Middle Ages, and rightfully so. Nobody implies that other medieval councils somehow have less authority than Lateran IV, but Lateran IV clearly has a pride of place. It is because of the great success and fruits of Lateran IV that it is accorded this honor, without meaning to detract from the authority of other councils. Is Lateran IV more authorative than Lateran III? Not at all - but Lateran IV was much more successful and bore better fruits than Lateran III, which is virtually forgotten. Second, we have to remember that, despite their close association, the Novus Ordo and Vatican II are not the same thing. The Novus Ordo was not promulgated until Advent of 1969. It is not part of the Council. The Council called for a revision of the liturgical books and laid the path for the Novus Ordo, but it is nevertheless distinct from the Council itself. This means, as far as I can tell, that one is free to call into question the prudence of the Novus Ordo without in any way impugning the authority of Vatican II, which ended four years before the Novus Ordo was promulgated. I really and truly think that, despite whatever problems may have been lingering in the Church in 1958, things would have turned out better had the Council never been called and had the Church simply stuck with the traditional Mass. Once a liturgy is promulgated by the lawful authorities, we are bound to accept it - but we are not bound to accept the prudence of the decision to promulgate that liturgy in the first place. I for one would like to see some acknowledgement of this fact by those who tend to lump all traditionalists in with the Sedes and SSPX. The Holy Spirit guides the Church and protects it from promulgating error as truth; He doesn't protect it from making sloppy administrative or pastoral decisions, and there is nothing wrong with pointing this out. So, forty years of the Novus Ordo this weekend. I can give the Novus Ordo its due, mind you. I have seen some extraordinarily reverent celebrations of the NO, at my own parish for starters. All the formative years of my faith have been in the NO and my spiritual life has been nourished by it. But witness the amazing transformation that it taking place today in the Church, three years after the Traditional Mass was unleashed with Summorum Pontificum! Traditional Latin Masses are sprouting up all over the world, bishops are starting to stand up for the faith, there is a renewed interest in Catholic identity, a better translation of the Mass texts and the fruits of Benedict XVI's thought on the liturgy are spilling over into more reverent celebrations of the NO all over the world. This is the type of renewal we need - and Benedict didn't need to call a Council to get it either (this is a fruits argument I can go for)! Why do I cite this? There are those who say that orthodox, conservative Catholics and faithful, obedient traditionalists are really just the same thing. I'm not going to repeat my past mistake of trying to make generalizations about this, but in my own case, and in the case of this person quoted above, there is a definite difference between the two, one that one perhaps only notices once one starts to identify themselves as a traditionalist. I like the way the commentor calls it a "progression"; that's really what it is. There is a spectrum, and as long as the TLM exists at one end it will continue to influence the NO and everything else along that spectrum - including the persons who move along that spectrum. My view of the Church is much more optimistic now than it was when I began this blog - the changes in three years have been amazing. The NO will remain, but it will probably look a lot different in the future. My guess is that over time the NO will take two divergent routes - one the one hand, the faithful will continue to explore the riches of tradition and the NO will gradually start to look more and more like the TLM; reverent celebrations of the NO will become the norm. Somewhere way down the line, it may be phased out or perhaps even merged with the TLM into something new. I don't think that would be ideal, but hey, it's happened before. On the other hand, those Catholics who hate tradition will continue to celebrate Masses irreverently, especially moreso as the Church rediscovers her identity. Their celebrations will finally become so irreverent as to become invalid and these branches will have to be supressed. These are my prognostications for, I'd say, the next one hundred years. In the meantime, happy fortieth birthday Novus Ordo. The NO is starting to do what all people do - though liberal and radical when they are young, as they get older they see the wisdom of their forefathers and begin to become more conservative and traditional. That's the way I see the NO going in the future.